New Age Nomad: Trike Man! Name changed to protect the innocent. 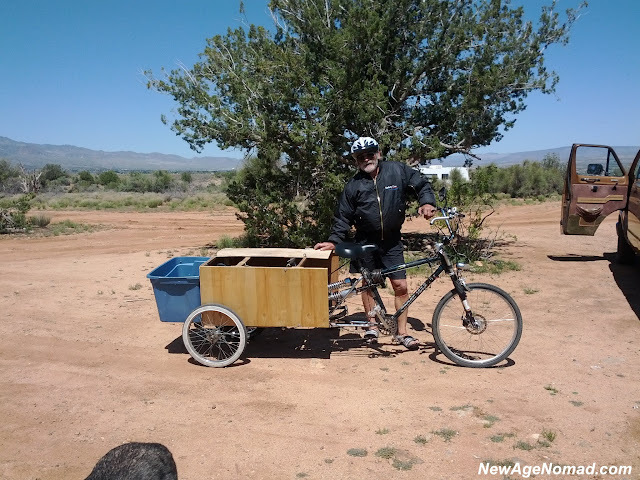 When I met Stan three years ago sitting around a campfire he told us tales of his motorcycle travels, how he lived under a bridge, and his dreams of building a gas powered trike out of old bicycles to travel country. Silently I questioned such a dream mainly because it was being told after consuming several cold water sandwiches, the fish always seems to get bigger under such circumstances. Imagine my surprise when two years later Stan pulled up on his Iron Steed! Well not exactly, but he was definitely proud. This model was still a work in progress, he plans to have his final version done by spring. This prototype has a 49cc engine or at least that's whats on the label, which he tells me will need no licensing, no taxes, and untraceable by big brother, also has a deep cycle battery for charging all of his electric goodies. That blue plastic tub on the back will hold over 250 pounds I even got a demonstration as he climbed in and starting jumping up and down like a kid who was let outta school early for the day..... This is where he will hold all his material possessions, and of course a satellite dish with T.V. Just what every Trike Dweller needs for those rainy days. Right now he's getting over 125 mpg! My hat goes off to Stan! While the masses are out running in the rat race working long hours to afford there previous purchases. (Economic Slavery as Stan refers to it) He will be out enjoying the sites, or perhaps some of his favorite re-runs. Definitely a different kind of freedom, but at least hes found it. "The opposite of courage is not cowardice, it is conformity. Even a dead fish can go with the flow"
What a story! Thanks for sharing it. nice!! just goes to show that if you really want something, you can figure a way to do it. Great story ..enjoying the freedom. I've seen guys with electric bikes on a bike trail ride, but this guy has quite the setup! And he lives in....??????? That's his plan. Knowing him I am sure he will pull it off! One of the best parts of traveling is the characters one meets and the stories to tell afterwards. Definitely I've met a lot of characters over the last 3 years. Most good, at times I've turned the key and left. Wouldn't work for me, there's no place to put my table saw. LOL Maybe get rid of the satellite?